I was honored to lead the discussion of how marketing and research must master big data in a digital social mobile age at the Weber Shandwick Data Salon on February 27, 2014. Here is a summary of my remarks. Written by GARCIA, JERRY / HUNTER, ROBERT / LESH, PHILIP / WEIR, BOB Published by Ice Nine Publishing Company (ASCAP) © 1970. Performed by the Grateful Dead. 1. OWNED MEDIA: Brand Owns Media Property (e.g. Brand’s website, app) that people choose to seek out and use. 2. EARNED MEDIA: Consumers choose to talk about a brand via Social Media. Brands can amplify their spend by launching initiatives that get consumers to share thoughts about the brand with their respective social networks. Back in the day, there was no visibility into the process of consuming, depleting, preparing to shop and then transacting, other than through surveys or qualitative research. The essence of reinventing marketing and research practices is to note that this has fundamentally changed in a digital world. 1970’s: Surveys, qualitative research, Nielsen was reporting Market Share bi-monthly based on “Clipboard” data collection. 1980’s: Advent of store scanner data (weekly share reports). Showed giant spikes associated with trade promotions. This affected marketing spend with tens of billions of dollars shifting to trade promotion to get more spikes. 1990’s: The advent of Frequent Shopper Data. This gave us the ability to forensically infer shopper insights based on purchases, having tremendous effect on shopper marketing and retailer outcomes. 2000’s- present: New Data streams “occur in the wild” – provide the ability for marketers to extract predictive signals regarding the consumer to shopper process…and every predictive signal is also a point of digital marketing impact. …but sadly, we are still to looking backward while driving forward. Over-reliance on marketing mix modeling to determine what marketing levers work. This puts marketers at least 3 years behind contemporary marketing as these approaches require historical data so they cannot read emerging touchpoints. Survey based brand and campaign trackers. 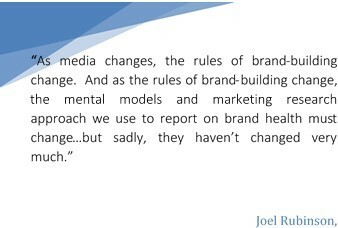 Not complete enough as measures of brand health if they do not include digital signals, too slow to effect campaign spending changes in flight, use attribute terminology that trails consumer vocabulary. Lack of a big data infrastructure that automatically databases all campaign results, properly tagged, so they can be referenced to improve the next campaign. Lack of a big data strategy for databasing, enriching, mining, and acting on first party data from customer transactions, web analytics, and social conversations and digital behaviors. Getting from point A to point B. In most product categories, it is a zero-sum game. Market share is not easy to come by because your guys are good, but their guys are good also. So everybody needs to be great to be able to figure out how to extract market share from the consumer process. This is an era of lean marketing where we need to make our marketing investments work harder via amplification and precision targeting. What’s needed? In the world of Big Data, we need to act strategically and execute on data. If there are insights that lead directly to marketing actions and better programmatic ad buying, you can not leave that on the table. If I had to choose one word, it would be “forward” where we need to adopt a predictive mindset. People don’t want ¼” drillbits they want ¼” holes. Similarly, we marketers don’t want copy testing, we want marketing spend effectiveness and efficiency. 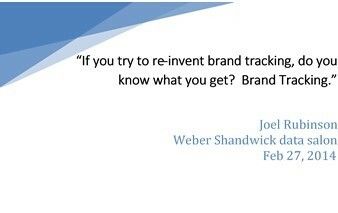 We don’t want brand tracking, we want brand success guidance. We need prediction more than scorecards. We don’t want brand profiles, we want to use predictive analytics to best target advertising for maximum sales lift and to keep the brand on strategy. Here are some basic building blocks to make advertising more precise and compete based on data. UNDERSTAND THAT DIGITAL MARKETING EXCELLENCE IS PREDICATED ON BEST IN CLASS MANAGEMENT OF FIRST PARTY DATA, AND THEN ENRICHING THAT WITH THIRD PARTY DATA. BE READY FOR THE EMERGING WORLD OF DATA FROM SENSORS (INCLUDING GEO INFORMATION FROM OUR SMARTPHONES BUT ALSO HEALTH BANDS, ETC.) AND DATA FROM APPLIANCES, THERMOSTATS, REFRIGERATORS TALKING TO SHOPPING APPS, ETC. The payoff? Leveraging data and predictive analytics, we can improve odds of delivering the right message, to the right person, at the right time, on the right screen and turbo charge marketing ROI as a result. On March 12th, I will be a panelist at a free luncheon event at the NY Hilton, Bridging the CIO-CMO gap, where I will amplify these remarks and the panel will provide concrete technology solutions. To see the invitation, click here. To register, click here. Good stuff and thanks for sharing. One area I would say needs more emphasis is the first party cookie. But because that typically suggests website only I’d say “any first party communication channel” and the insight that can be gained from each and every interaction people have within the brand’s first party environment. Today, focus is almost exclusively on counting. Counting clicks, views, opens, etc. Marketers need to learn more from each interaction and uncover the meaning behind those behaviors at an individual level…interests, affinities, etc in the moment and in real time. Do this, it becomes an integral process and data captured by marketing research that can inform strategy and execution alike. thanks for pointing this out as I certainly am a believer in the power of building brand audiences for two main purposes…accumulating powerful first party data and amplification of paid media using owned and earned media channels. For me, big data success really starts with first party data…web analytics, content consumption indicating what users value, conversion as a result of display, customer data, customer care, and social media conversation that is matching by handle are all streams that count.